``vals. Anyway, perhaps the time off was a blessing in disguise, because I decided to focus on my painting instead. In late winter of 2009, I decided that I have a large enough body of work now and that just maybe, it is good enough to be seen by the public. 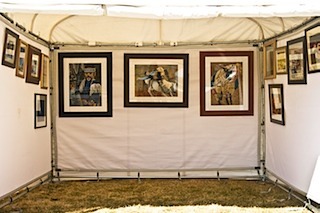 So I put myself out there and applied to some local art festivals with my pastel paintings. Well, I can definitely tell you that it is very different, from a emotional point of view to enter your paintings rather than your photography. You have a much deeper, personal connection to your painted work, than a photograph - at least I do. It was pretty difficult to get turned down for my photography - it is an even deeper psychological hit to get turned down for the painting that you have put hours and your heart and soul into. But, I found some courage and submitted some applications. The first show that I applied to was the Downtown Denver Art Festival. This is a fantastic show, and is only open to Colorado artists. It is over Memorial Day weekend and is held at the 16th Street mall, funnily enough, in downtown Denver. Jim Delutes runs the whole thing and he is a great guy. Unfortunately, I was turned down for this one. Not even on the waiting list. I have no idea if it was my artwork not being up to par, or an error I made on the application process. (They do offer to let you know how you were juried, but I didn't have enough guts to hear it). At the time I had filled out the application, I had not yet had the chance to get my new tent set up with my pastel paintings. 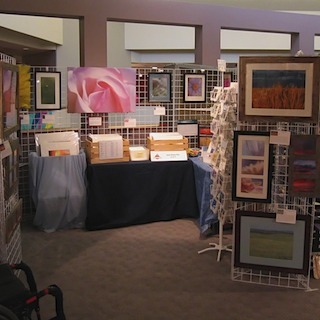 So I sent in my application with my booth shot from the shows with my photography. This is a big no-no. The jury members want to see if you have a complete body of work and that it matches with the art that you sent in for the jury process. Needless to say, my photography didn't match up with my pastels and I'm going to assume that this is why I did not get into this show. At this point in the application process, I'd much rather think that it was the booth shot and not that my work wasn't good enough. But it was a pretty big blow to the old ego. I now had to decide if I had enough courage to try again (I really HATE rejection).